Stronger Together is a caucus of NYSUT that began when former President Richard Iannuzzi was unceremoniously overthrown by Mulgrew three years ago. 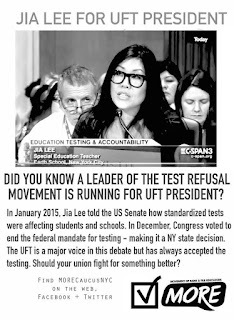 A lot of locals didn't much like being told by UFT leadership who could and could not run NYSUT. The officers being overthrown ran against the Mulgrew-selected ticket, and PJSTA President Beth Dimino recruited MORE to represent UFT in the run against NY State Unity. I thought it was kind of cool that Hillary used their name in her campaign. It was pretty cool to see Stronger Together written in big letters on her campaign jet. Back when she was a sure thing, I thought maybe they'd follow in their footsteps. Now that I know exactly what she was a sure thing for, I'm afraid I was right. As of now, Stronger Together is running a new ticket, once again with only four candidates. My caucus, MORE, was affiliated with Stronger Together for the last few years. The MORE rep for ST reports being treated very poorly by them, being told that they were union presidents and he wasn't, and was somehow not on par with them. I have a little experience with union presidents acting superior to mere members, so I don't find that too hard to believe. When I realized that Stronger Together was running four people against five, I saw an instant solution to my problem, which is that they have no UFT representation whatsoever. They could run Jia Lee, who bravely faced an uphill battle against Michael Mulgrew last year. They could run James Eterno, who got the majority of high school votes for High School Vice President, but who isn't VP because UFT Unity rigged elections precisely so he couldn't win. They could have run a hundred different UFT members. But they didn't ask any of us. That's because their election process entailed sending an email, putting a post on Facebook, and then having 12 people decide who would run. I discussed it with Eterno a month later, but we evidently made the assumption that someone would contact us. We were wrong. So then the question becomes this--Why didn't Stronger Together solicit a UFT candidate for their ticket? The answer could be they assumed there was no interest, which is what they told me. However, I know Michael Lillis, the Presidential candidate, to be very smart. I don't believe for a New York minute that it didn't cross his mind to call Jia, or James, or me, or anyone at all in UFT. What I believe is that his caucus thought being affiliated with us would hurt their chances of the fusion ticket they so much wanted to create with Unity. I have no idea why Unity would not have noticed our previous affiliation, or indeed why the hell they'd be motivated to do any sort of fusion ticket. Of course they did not. Once that happened, Stronger Together decided to run their four-person ticket. They could have easily added a fifth, but chose not to. So in the virtually unimaginable scenario that they win, it will be four of them and one of Mulgrew's. Of course it wouldn't be Andy Pallotta, who seems to be the only UFT member running. 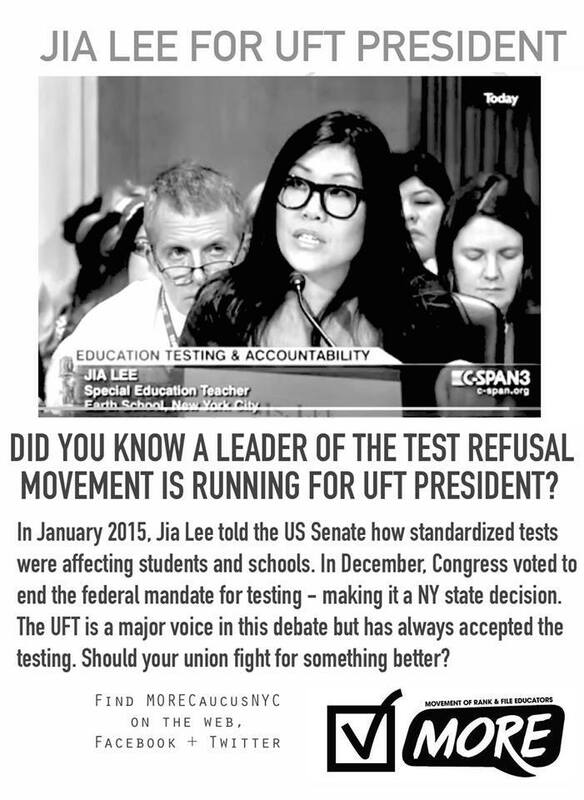 Now that would be kind of cool, as UFT leadership would be frozen out of NYSUT in at least some small way. Their enormous voting bloc would mean nothing whatsoever, and they'd actually have to listen to someone for a change. In the era of Brexit, and Donald Trump, you'd think such a miracle could take place. Now I often love miracles, but the ones taking place lately have not been the sort that I get excited about. So I'm not precisely holding my breath for this one. So the question remains why ST didn't reach out for UFT representation. Could their negative relationship with a single MORE member have led them to stereotype us? I don't think so. Lillis is smarter than that. Could it be that it did not occur to Michael Lillis to pick up a telephone and look for UFT representation? I doubt it. Could it have been that they were so giddy over the possibility of getting a few cool gigs via that fusion thing with Unity? Maybe. But whatever it was, the egregious error of ignoring the largest teacher local in the country, with 28% of the total members of NYSUT was a very bad idea. It shows a fatal lack of forethought and consideration and fails to sufficiently differentiate them from the machine they're facing. Maybe they'll come to their senses after they lose, and maybe they won't, but their lack of vision right now is nothing short of appalling.